If your order weighs less than 13 ounces, save huge on shipping with USPS first class (with tracking number). This product weighs 8.4 oz. 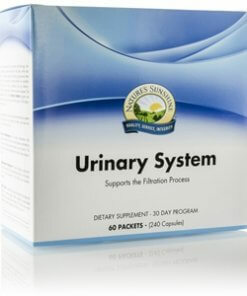 Nature’s Sunshine Urinary System Pack is a 30 day program to strengthen and maintain adequate urinary tract function. This body system pack supports the body’s filtration, providing potassium and sodium. This 30 day program also supports the kidneys. 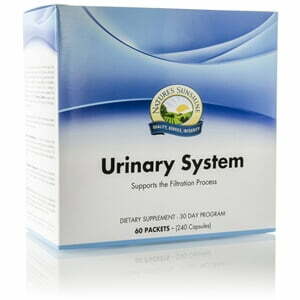 This herbal combination supports the delicate fluid and mineral balance controlled by the kidneys and helps promote proper urinary function. It also contain nutrients which help the body adapt to stressful situations. Provides potassium to help maintain fluid and electrolyte balance in the body. Potassium is a critical component of the filtration and excretion process. This traditional Chinese formulation helps the kidneys remove toxins while protecting water-soluble minerals that support bone integrity. It also helps maintain the body’s proper acid/alkaline balance.